WASHINGTON (Reuters) - The U.S. Supreme Court on Monday threw out the conviction of a Pennsylvania man found guilty of making threatening statements on Facebook to his estranged wife, law enforcement officers and others. U.S. top court throws out Pennsylvania man's conviction for Facebook threats -- This article courtesy of Reuters. The court ruled on an 8-1 vote in favor of Anthony Elonis, who served prison time for posting a series of statements on the social media site in 2010 after his wife left him. Seven justices voted to throw out his conviction, while Justice Samuel Alito said he would have sent the case back to the appeals court for it to decide. Elonis’ Facebook posts, written in the form of rap lyrics, talked about killing his wife, knifing an female FBI agent and shooting schoolchildren. After a court granted his wife a protective order against him, Elonis posted: "Is it thick enough to stop a bullet?" The justices ruled that in order to prosecute Elonis, it was not sufficient that a reasonable person would have interpreted the remarks as threatening but rather that Elonis had to have intended the words as threats. "Federal criminal liability generally does not turn solely on the results of an act without considering the defendant's mental state," Chief Justice John Roberts wrote of behalf of the court. The case touched upon the rise of social media and how people use it to express strongly held feelings. But the legal question decided by the court was that Elonis needed to be aware of the threatening nature of his communication in order to be convicted. Lower courts had said he could be culpable regardless of whether he believed his messages could be viewed as threatening. Justice Clarence Thomas was the only member of the court who would have upheld the conviction outright. He criticized the court’s reasoning, saying it "throws everyone from appellate judges to everyday Facebook users into a state of uncertainty." Alito partially disagreed with the outcome, saying the appeals court should be given another opportunity to decide whether the conviction could be upheld. Elonis was convicted of violating a federal law that outlaws sending a threatening communication and was sentenced to 44 months in prison. The case is Elonis v. USA, U.S. Supreme Court, 13-983. 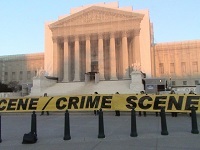 Whether, consistent with the First Amendment and Virginia v. Black, 538 U.S. 343 (2003), conviction of threatening another person requires proof of the defendant's subjective intent to threaten, as required by the Ninth Circuit and the supreme courts of Massachusetts, Rhode Island, and Vermont; or whether it is enough to show that a "reasonable person" would regard the statement as threatening, as held by other federal courts of appeals and state courts of last resort.